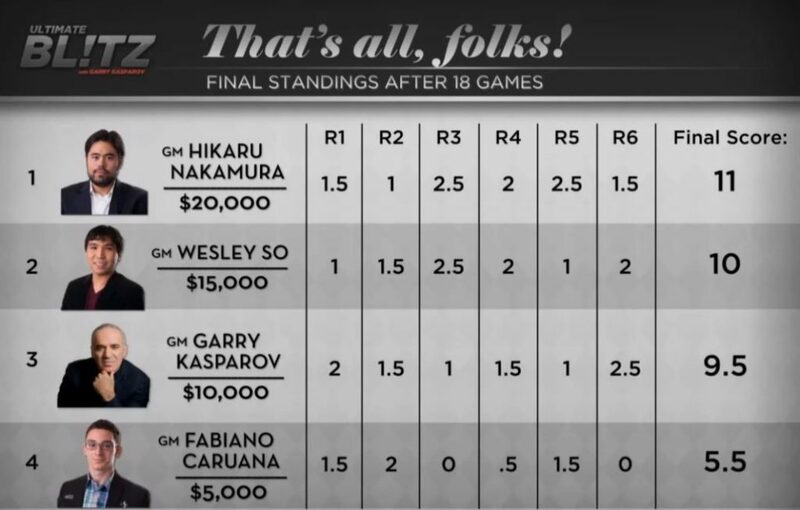 The last day of the challenge has finished, and Hikaru Nakamura came out to be the overall winner, followed by Wesley So with a full point behind. Garry Kasparov retained his 3rd rank from Day 1, and so did Fabiano Caruana, the champion of the US Chess Championship 2016, his tailender. Thus, at the end of this challenge, the Wesley So vs. Garry Kasparov matchup stands at 4.0-2.0 in favor of Wesley So. Read more about: Nakamura is the Ultimate Blitz Champion! You may replay each and every game and download PGN of the US Ultimate Blitz Challenge 2016.